"My husband calls this extreme Hamburger Helper® and says it is an awesome dish for a cold night as a yummy comfort food!!" Melt the butter in a large skillet over medium heat. Stir in the cabbage, and cook until just wilted, about 5 minutes. Pour in the chicken broth, and bring to a simmer. Cook until slightly reduced, about 10 minutes more. Stir in the cream, and season with salt and pepper. Keep the cabbage hot over low heat while preparing the ground beef. Heat a Dutch oven or large skillet over medium-high heat and stir in the ground beef. Cook and stir until the beef is crumbly and no longer pink. Add the onion, and cook until tender, about 5 minutes. Stir in the smoked paprika and mustard. 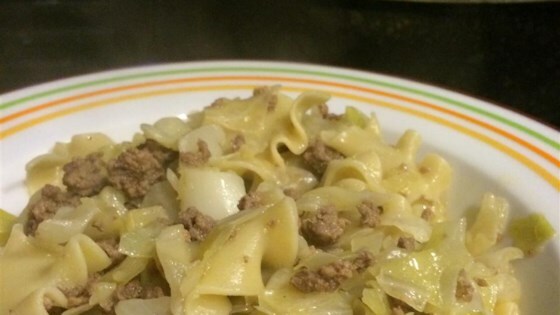 Stir in the cabbage mixture and egg noodles; season to taste with salt and pepper. Cover, and cook over low heat until the noodles are tender, about 10 minutes. Pour in water as needed so the noodles do not become dry. This was an easy dish to prepare, and had good taste. I had to add more liquid, as it cooked it up quite a bit. Good aroma and good comfort food. Pretty good, but rather bland. I made the recipe exactly as written, and it needed something more. I have a large amount left over, so perhaps I'll add cheese when I reheat it.